E-commerce has upended the way consumers spend their money. This new world of shopping has disrupted the entire retail sector, turning heroes to zeroes (really) and elevating some providers, founded entirely on the industry's promise, to the ranks of the largest companies in the world. E-commerce is making up a larger and larger portion of the U.S. retail picture. The U.S. Census Bureau reported that domestic e-commerce sales totaled $130.9 billion in the third quarter of 2018, a 14.5% increase from the same period the year before. Overall U.S. retail sales rose just 5.3% over the same period. E-commerce's steady growth over the past few years means it now makes up roughly 10% of total U.S. retail revenue. 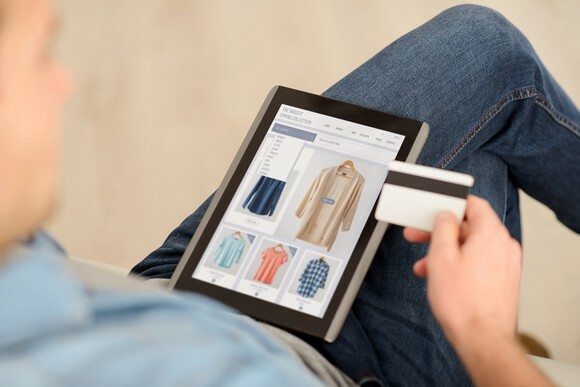 In just two decades, e-commerce has completely changed the way consumers shop. Image source: Getty Images. Yet even these statistics don't tell the whole story, because the overall retail figure includes businesses that don't naturally lend themselves to e-commerce, like gas stations, car dealerships, and suppliers of building materials. Adjust for this and e-commerce would represent a much higher percentage of overall retail. In developing markets, which often lack robust landline service, mobile commerce becomes even more significant. In Latin America, for instance, mobile transactions grew 37% from 2016 to 2017, according to online marketing company Criteo. In the Middle East and Africa, according to the same survey, two-thirds of all e-commerce transactions were generated through an app or a mobile web browser. Retailers that do not accommodate mobile shoppers may soon be surpassed by those that do. E-commerce makes it easier and more convenient than ever to purchase goods and services. When you buy something online instead of going to the store, you save time and sometimes money. Let's focus on two aspects of that: ever-improving delivery options, and the rise of mobile computing. In February 2005, Amazon.com launched Amazon Prime, a subscription service that unlocked "free" two-day delivery for most products, essentially changing the e-commerce landscape forever. By 2009, some items were eligible for same-day delivery to Prime members in select cities. While the move killed Amazon's profitability in the short term, CEO Jeff Bezos remained focused on the long-term benefits. In hindsight, it's easy to see that he was right. 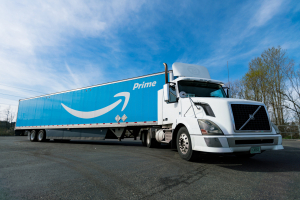 In the early days, when Amazon charged a $79 annual fee, the company lost money on every Prime member, but as Amazon increased the fee to $119 and built out its delivery capabilities, Amazon's competitors were the ones feeling the pain. Whether or not Amazon's competitors ever catch up, one thing cannot be denied: Fast delivery at a low cost is now a necessity in e-commerce. 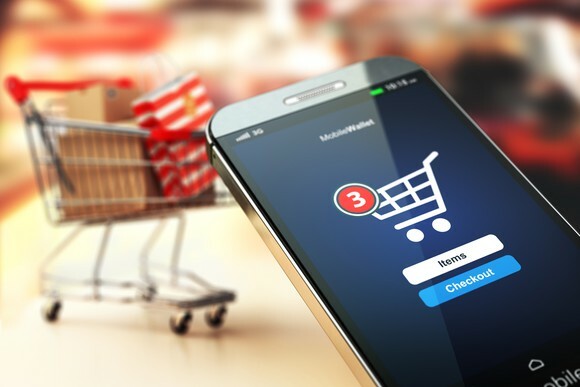 M-commerce, the act of buying products from a mobile device, is in many ways the natural progression of e-commerce, as smartphones have become nearly ubiquitous and are being used for more tasks than ever. In 2016, mobile accounted for 69% of total digital media time, according to analytics firm Comscore. This has come to naturally include shopping, just one more way consumer behavior has changed in recent years. In 2017, m-commerce made up 34.5%, or just a little over one-third, of e-commerce sales. By 2021, that number is projected to grow to 53.9%. In 2017, m-commerce made up just a little more than one-third of e-commerce sales. By 2021, that number is expected to make up more than half of e-commerce. Image source: Getty Images. What are some examples of e-commerce businesses? Not every e-commerce company is alike. Let's look at a few different kinds. Some e-commerce companies offer platforms for sellers to operate virtual storefronts. The most famous example is probably eBay, which is known for its online auction format, but there's also Etsy, which specializes in handmade goods and custom products, and Shopify, which provides tools that let any entrepreneur start selling online. Other businesses sell their own dedicated brands online separately from their physical stores. So, for instance, on the Michael Kors Holdings website, customers will find the company's own fashion brands for sale, including Kors and Jimmy Choo merchandise. This is another basic model. There are also hybrids that sell their own wares in addition to hosting merchandise from other vendors. The best example of this is undoubtedly Amazon. Finally, some businesses are omnichannel retailers, meaning you could buy something online and pick it up in person -- which is helpful if you're ordering something too large or bulky to leave on your doorstep. Home Depot is a great example of this: Management said that in the second quarter of 2018, not only did online sales grow 26% over the same period the year before, but 47% of all online orders were picked up in person. With the e-commerce world growing so quickly, I believe investors are better served focusing on companies that stand to prosper no matter which trends prevail or which individual retailers prove more adept than others. It's a fool's errand to try to determine whether, for instance, Costco Wholesale or Target will outdo each other in e-commerce sales when you consider neither offers something unique to online shoppers. With that in mind, here are 10 potential investments covering nearly every aspect of e-commerce that should give you excellent opportunities to beat the market. Data source: Google Finance. Data as of Jan. 11, 2019. Let's take a closer look at some of the companies operating in parts of the industry we haven't discussed yet. Yes, I'm cheating -- these are two companies worthy of investment. They both make great e-commerce stocks for the exact same reason: Electronic commerce requires electronic payment, and these are the two largest payment-processing companies in the world. Mastercard and Visa take a small fee each time a payment is processed on their networks -- that is, when a cardholder makes a purchase from a merchant and money needs to flow from the cardholder's bank (known as the issuer) to the merchant's bank (known as the acquirer). Those small fees add up to big revenue. Simple numbers. E-commerce is growing five times as fast as face-to-face transactions. And in an e-commerce transaction, the propensity to use a Visa card is twice as high as a face-to-face transaction. So something growing five times as fast where your propensity to be used is twice what it might have been. That's phenomenal. This makes perfect sense, even when considering just the stocks already discussed above. At fast-food restaurants, patrons might use cash for low-value transactions, but now they are ordering for delivery on GrubHub. Artisans are now selling more crafts on Etsy than at local festivals, where cash might be used for purchases. A handyman coming into Home Depot might pay cash for the materials and tools he needs for his next job. Now, though, there's a good chance he's having them delivered to the job site on the day he starts the project. In all these cases, transactions that may have previously been conducted in cash are now being done through apps or online, where they are much more likely to be done across Mastercard's or Visa's network. With over 250 million active user accounts, PayPal has become a dominant force in e-commerce. It functions as a digital wallet, a service that lets users make transactions simply and securely just by logging in. Customers love PayPal for its convenience, exemplified by its One Touch feature. One Touch allows users to register a device and make purchases at eligible websites with just one click — PayPal uses their saved preferences for payment and delivery to complete the transaction. Gone are the days of retrieving the credit card from your wallet and entering tedious information such as billing addresses and expiration dates. CEO Dan Schulman has called One Touch "the fastest-adopted product in our history," and as of the third quarter of 2018, it had 112 million consumers and 10.4 million merchants registered. According to Comscore, 99% of users gave it a rating of "good" or better and 55% said they made online purchases because One Touch was an option. Merchants love this convenience too, because customers who select PayPal as their payment method are far more likely to follow through with their purchase than those who pay with something else. 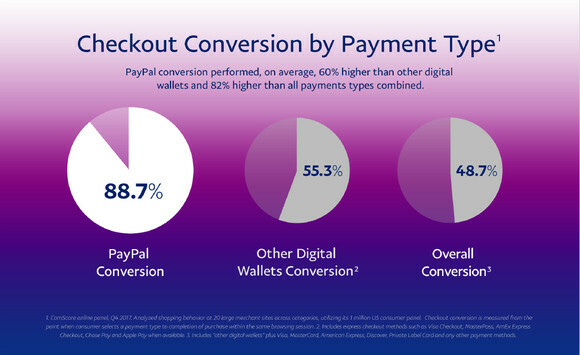 According to a company study using data from Comscore, 88.7% of e-commerce customers who chose PayPal when they began checkout completed their purchase in that same visit. That's way more than the 48.7% rate overall. Online retailers don't want customers leaving items sitting in their shopping carts, so offering PayPal as an option is a must. Consumers who pay with PayPal tend to follow through with their purchases at a much higher rate than online shoppers in general, which is a positive for customers and merchants alike. Image source: PayPal Holdings. Because e-commerce is a comparatively young industry, many of the companies associated with it are earlier in their life cycles. That means big sales growth but also lower profitability. For instance, Shopify's sales in the third quarter of 2018 grew 57.5% over the same period the year before, and it's generated almost $1 billion in total sales over the past four quarters -- yet it's still unprofitable. If you're interested in e-commerce but you're more comfortable with profitable businesses that actually pay you to own them, WestRock may be perfect for you. WestRock is a paper and packaging company whose massive reach helps it differentiate itself from most of its competitors. In 2017, the company generated $1.2 billion in free cash flow (the cash that's left over after a company has paid for operating expenses and investments in property and equipment). Some $500 million of that was returned to shareholders via share buybacks and dividends, which can both be shareholder-friendly moves when done right -- buybacks decrease the number of shares on the market, making the remaining ones more valuable, and dividends are cash payouts that go straight into shareholders' accounts. WestRock also makes acquisitions, like its $4.9 billion purchase of Kapstone Paper and Packaging, which helped it expand its core competencies and geographic reach. WestRock firmly believes that long-term trends such as e-commerce will propel growth for paper and packaging industry for years to come. In 2017, the company's adjusted segment EBITDA was $2.3 billion, a figure the company is projecting will increase to $4 billion by 2022. XPO provides transportation and logistics solutions for more than 50,000 customers in 32 different countries. When we consider that e-commerce requires almost all goods to be delivered after an online purchase, XPO seems to be in a unique position to benefit from this boom in delivery services. XPO consists of two operating segments: transportation, which accounts for about 63% of revenue, and logistics, a data-oriented business that serves customers' warehousing, distribution, and inventory management needs and accounts for approximately 37% of revenue. Unlike more familiar delivery companies, such as FedEx or United Parcel Service, XPO operates a more asset-lite business model, operating brokerage and logistics services without actually owning nearly as many trucks, ships, and other physical assets. Our warehouses are becoming high-tech hubs with collaborative robots, drones for inventory management and sophisticated analytics for demand forecasting. Our algorithms can predict the flow of goods and future returns, helping our e-commerce customers plan for peak inventory, capacity and labor levels. We recently started using dynamic analytics in our warehouses to optimize workforce productivity day by day, and shift by shift. Our proprietary technology facilitates omnichannel distribution, lean manufacturing support, aftermarket support, supply chain optimization and transportation management. These investments are already beginning to pay off. In June 2018, XPO signed a deal with Nestle to collaborate on a 638,000-square-foot warehouse in the U.K. that will feature state-of-the-art robotic automation and advanced sorting technology. E-commerce is a trend whose time has come, and it presents serious opportunities for savvy investors. Some of you might think of Amazon's massive size and dominance of the market and worry that you've missed the boat -- but just remember that there's still a huge opportunity not only in the U.S. but also around the world. While there is no guarantee how these companies and their stocks will perform in the short term, they've each demonstrated their strength -- and we think they've shown they have what it takes to deliver market-beating returns over the long term. John Mackey, CEO of Whole Foods Market, an Amazon subsidiary, is a member of The Motley Fool's board of directors. Matthew Cochrane owns shares of Amazon, Home Depot, Mastercard, and PayPal Holdings. The Motley Fool owns shares of and recommends Amazon, Etsy, Mastercard, PayPal Holdings, and Shopify. The Motley Fool owns shares of Michael Kors Holdings and Visa and has the following options: short February 2019 $185 calls on Home Depot, long January 2020 $110 calls on Home Depot, and short January 2019 $82 calls on PayPal Holdings. The Motley Fool recommends Costco Wholesale, Criteo, eBay, Home Depot, Nestle, and XPO Logistics. The Motley Fool has a disclosure policy.